janetfang.com | The portrait of a science writer before she becomes one. The portrait of a science writer before she becomes one. Two driving forces acting on wet spider silk help it to capture water. 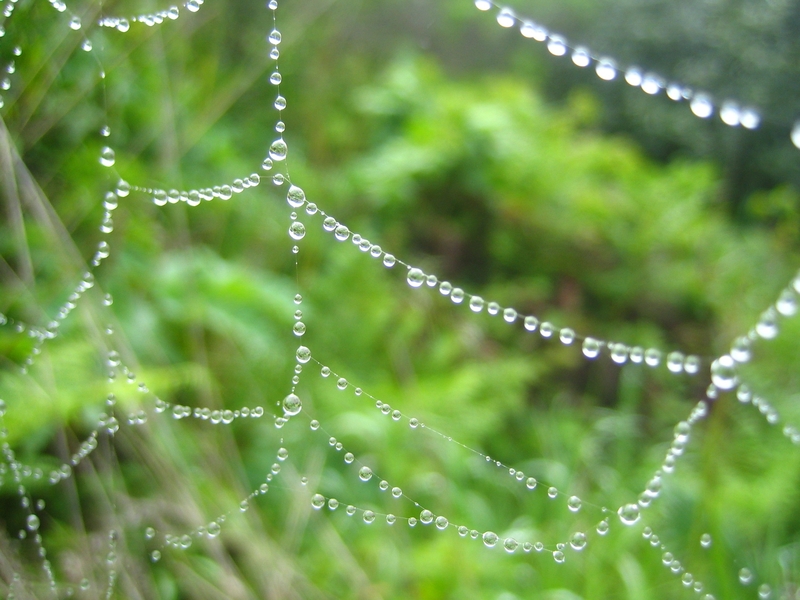 Researchers have puzzled out how spider silk is able to catch the morning dew. Their findings may lead to the development of new materials that are able to capture water from the air. Dry spider silk forms a necklace-like structure. Two main fibres support a series of separate rounded ‘puffs’, each made up of tiny, randomly intertwined nanofibrils. When water vapour condenses onto these puffs, they shrink into densely packed knots, shaped like spindles (or two cones with their bases stuck together). Thinner connecting stretches of nanofibrils, separating the knots, become more apparent; these areas are called ‘joints’. 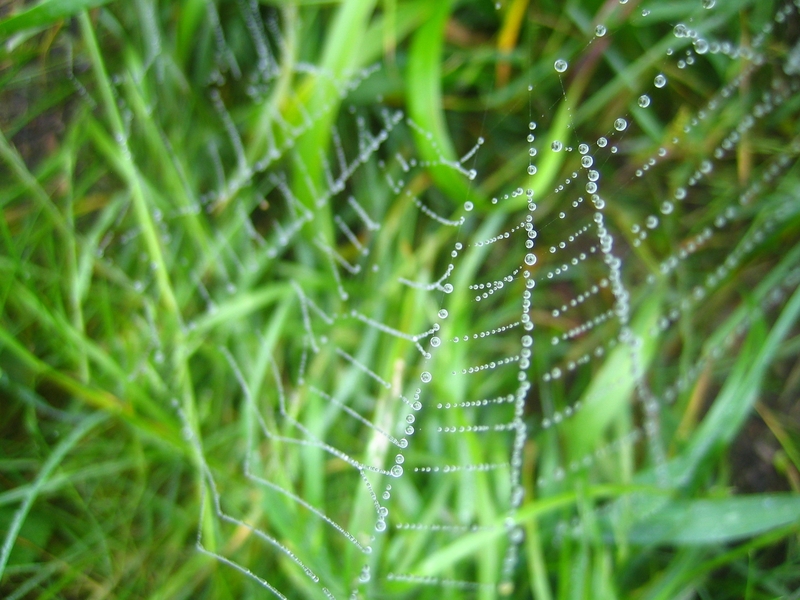 The researchers studied the webs under both electron and light microscopes. They noticed that as water condenses on the web, droplets move towards the nearest spindle-knot, where they coalesce to form larger drops. The spindle-knots have a rough surface, because the fibrils within them are randomly interweaved. But the joints between the knots have a smooth texture, because their constituent fibrils run parallel to each other. It is this difference in roughness that helps water drops to slide towards the spindle-knots, sticking when they arrive. The cone shape of the spindle-knots also drives droplets towards their centre. 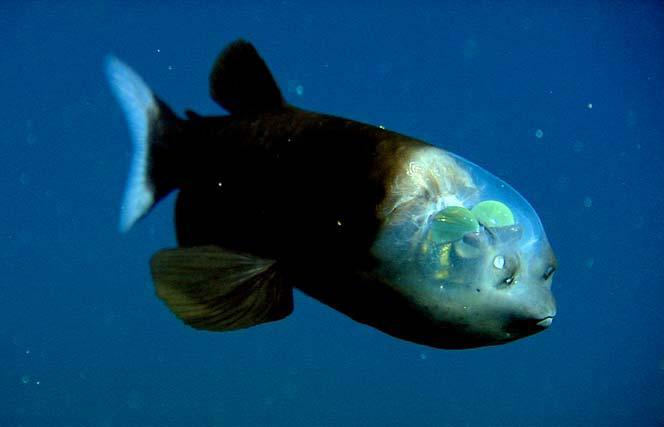 Once they hit the edge of a cone, drops are propelled towards its base, the least curved region, because of the pressure difference caused by surface tension. Guided by their findings, the team made their own artificial spider silk using nylon fibres dipped in a polymer solution that, when dried, formed spindle-knots similar to those in natural spider silk. They anticipate that their studies of these fibres could lead to new materials for collecting water from the air. “It is impressive that they were able to produce an analogue of wetted [spider] thread that duplicated the properties that they observed,” says spider silk expert Brent Opell of Virginia Tech in Blacksburg. But it doesn’t seem likely that natural selection has directed the evolution of this particular spider’s silk for water collection, he adds. The spider’s thread seems to have evolved to work best when it is dry. As Jiang and his colleagues show, when the spider silk is wetted, the fibrils are matted down. “From a spider’s perspective, this is a bad thing because it reduces the web’s ability to capture prey,” Opell says. “The authors of this paper are studying an artefact,” says zoologist and spider-silk expert Fritz Vollrath of the University of Oxford, UK, “which is still interesting although it has no biological function”. 1. Zheng, Y. et al. Nature 463, 640-643 (2010). Scientists have long suspected that the sun affects climate on Earth, but that connection has proved hard to pin down. Researchers recently demonstrated that the 11-year cycle of solar activity influences weather in the tropical Pacific Ocean. Even then the exact cause remained obscure, since the sun’s brightness varies by just one-tenth of a percent. Two studies from 2009 are filling in the gaps. In August an international team lead by Gerald Meehl, a climatologist with the National Center for Atmospheric Research, announced that the sun’s outsize influence results from its combined effects on our atmosphere and oceans. When the sun is at its most intense, ozone in the stratosphere absorbs more ultraviolet energy, making areas near the equator warmer than usual. The added heat changes wind patters, bringing more rain to the western tropics. At the same time, the extra sunlight causes more evaporation off the ocean, which adds to downpours in the western tropics. Simulations that modeled just one of these effects failed to match the real world. Meehl saw that the two mechanisms “feed off each other, producing a stronger response than either can alone.” His results should help climatologists predict monsoons in Asian and overall climate in North America and might someday allow them to estimate seasonal rainfall years in advance. Meanwhile, Henrik Svensmark of the Technical University of Denmark and his colleagues are exploring a broader climate impact of solar activity. He believed that cosmic rays—energetic subatomic particles from outer space—help seed could-forming water droplets in the lower atmosphere. During peak solar activity, eruptions from the sun spew out huge clouds of plasma that shield Earth from those cosmic rays. After examining could cover and cosmic ray fluxes, Svensmark concluded that declines in cosmic rays lead to fewer clouds, implying that an active sun could lead to warmer surface temperatures. Following the strongest solar eruptions, he found that the sky lost 7 percent of its cloud water. Many scientists doubt the significance of these cosmic ray effects, but Svensmark sees the question as ripe for investigation. “The sun is doing natural experiments on Earth’s atmosphere, giving us the opportunity to test these ideas,” he says. From the sudden, violent motion of a single earthquake to the more gradual convection of its interior over millions of years, Earth is a dynamic planet. Geodynamics—the study of the forces and processes driving Earth’s tectonic plates—is an integrated science that draws from geology, geophysics, technophysics, seismology, fluid dynamics, and petrology. It’s natural for Lamont-Doherty scientists—enabled by the tradition of interdisciplinary studies and the breadth of expertise here—to pursue some of the most complex questions in geodynamics. With a combination of observation, theory, computation, and laboratory experimentation, they have begun to illuminate the most difficult problems and to provide the most relevant constraints. Nowhere does this effort have more impact on society than when significant earthquakes occur. Large earthquakes are among the richest phenomena on our planet, and to study them provides insight not only into their hazard and risk, but also into the deformation processes in Earth’s crust and uppermost mantle. Questions pertaining to mantle convection and plate tectonic movement, formerly considered as two distinct scientific problems, are now being looked at as one coherent system. It is incredibly productive to view the tectonic movements that triggered last spring’s earthquake in Wenchuan County—the Sichuan province of western China—in a geodynamic framework. Standard plate tectonics, in which rigid plates collide and generate earthquakes at well-defined boundaries, cannot explain entirely the forces that led to this disastrous event. Of course, the underlying cause is India’s collision with Asia, which has given rise to the Tibetan Plateau and the Himalayas. But rigid plate interactions are not sufficient to account for what happened in Wenchaun. Instead, a large body of work suggests that, in China and neighboring countries, the Eurasian plate is deforming internally. Much of this investigation has been an attempt to identify the nature of this deformation: Is it “platelike” (and thus explained by the localized shattering of the Eurasian plate into microplates), or is the deformation spatially continuous (thus behaving more like putty than pottery)? And which forces contribute to this unique style of deformation? “Earth scientists want to know what happens at all scales—both geospatial and temporal—and how localized systems interact with larger, global ones,” says Ben Holtzman, a Doherty associate research scientist. The 7.9-magnitude earthquake struck the semirural area outside of Chengdu at 2:28 p.m. on May 12, and aftershocks ranging between 4.0 and 6.9 on the Richter scale occurred over the next several days, weeks, and even months. Results were catastrophic, with more than 70,000 casualties. Most seismologists and engineers had estimated that ground tremors would reach only certain levels, and they built their civic infrastructure accordingly. “But the actual ground shaking recorded was three or four times greater than what had been projected,” says Arthur Lerner-Lam, associate director of Seismology, Geology and Tectonophysics at Lamont-Doherty. “How could we have been that far off?” he asks. Cow waste from Straus Family Creamery and human sewage from a Marshall manhole could help scientists develop better tests for the presence of harmful pathogens. Last month, Lawrence Berkeley National Laboratory postdocs Eric Dubinsky and Cindy Wu, assisted by Shariff Osman, conducted a census of poo microbes. Cattle and septic wastes were separately loaded into diffusion chambers—with semi-permeable membranes keeping bacteria in while allowing water and minerals in and out. The chambers were hung inside crab traps (left top) and submerged into Walker Creek at Gale Ranch (below) and Tomales Bay by Nick’s Cove (above). At various time intervals, large syringes extracted the diluted wastes, which were then filtered under vacuum (left bottom) to concentrate bacteria onto disks and frozen on dry ice. Their DNA will be placed onto the PhyloChip—a new gadget developed by Gary Andersen that differentiates between 32,000 bacteria types. Current water quality tests don’t discriminate between contamination sources, leading to unnecessary beach closures and ranch restrictions. The team will determine which bacteria are unique to humans and which are unique to agriculture, and how those bacteria react in fresh versus salt water over time. Using that information, they hope to formulate a suite of indicator microbes that can accurately assess water safety. In a move unauthorized by his board, the manager of the Marin/Sonoma Mosquito and Vector Control District cancelled the district’s No Spray agreement. Last week, over 500 Marin and Sonoma residents who were previously on a No Spray list received a certified letter stating that the list was replaced by a 48-hour notification system. West Marin residents fear that Jim Wanderscheid’s decision violates a five-year agreement they have with the district that prohibits spraying other than during emergencies. The letter stated that residents would be given a 48-hour advance notice if their home is within 3,000 feet of an area scheduled to be treated for adult mosquitoes using a truck-mounted spray unit, or fogger. Advance notice would not be given before other control efforts, including hand-held adulticide sprays. According to the letter, the district will assume that residents are not interested in being notified if they do not submit their contact information by May 1. But the regular April meeting of the district, which would give people an opportunity to discuss the issue, has been cancelled. “The compounded problem is, the board won’t even meet before May 1,” said Frank Egger, the Fairfax representative. Thirteen thousand pounds of electronic waste—as much as two elephant seal bulls or five Prius hybrids—were dropped off at the Dance Palace on Saturday. For over eight hours, Jesse Alcala, who grew up in Point Reyes Station and owns All About E-Waste in Martinez, collected obsolete or broken electronics and used batteries from hundreds of people, for free. All the electronic scrap was then sent to ECS Refining in Santa Clara, which will either remarket or recycle the waste. As a leader in environmental regulation, California doles out money to promote and fund e-waste recycling. The Electronic Waste Recycling Act of 2003 reduced hazardous substances used in certain electronic products sold in the state and enacted an e-waste recycling fee. Retailers collect an advance recycling fee from consumers for hazardous e-wastes—such as TVs, computer monitors and laptops and portable DVD players with LCD displays—that have toxic levels of copper and lead. These fees are turned over to the state. Effective this year, screens between four and 15 inches are charged a fee of $8; the fee for screens 35 inches and larger is $25. On Saturday, Alcala collected at least 137 TVs and monitors, some brought from as far as Bolinas. An approved collector and recycler with California’s Covered Electronic Waste Recovery and Recycling Payment System, ECS is reimbursed by the state. Besides car batteries and copper wires from phone and laptop cords, everything Alcala collects is sent to Santa Clara. ECS processes scrap electronics by shredding and separating the components—ferrous metals like steel, precious metals, copper, aluminum and plastic. The steel and aluminum are recycled, and the copper and precious metals are sampled, prepared and sent to a smelter. The alloys and ingots are then ready to be further shaped. Alcala receives 23 cents a pound for TVs and monitors and two cents a pound for electronic scrap. He and his wife, Audrea, started the company a year and a half ago. His plumbing, sandblasting and construction work began to slow down in the past few years, and when he went to recycle some old TVs, he learned about the electronic recycling from his friend, Charles Hurtado of Hurtado Recycling. All About E-Waste is Better Business Bureau accredited, and Alcala’s fleet now includes a Ford diesel F 350, a Jeep Comanche and a Ram 350. Alcala attended West Marin and Tomales High schools, but moved back San Francisco in the 1980s. One of his former teachers even dropped something off on Saturday. “When we got here in the morning, there were already five cars lined up. We didn’t even have time to set up tables,” Alcala said. The 14-foot rental truck made three trips, and all his vehicles were loaded to the top. Sony VCRs, Olympia typewriters, big cell phones from the early 1990s, fluorescent tubes and electronic toothbrushes covered the parking lot. Boxes labeled “JUNK” contained VHS tapes and cassettes that obsolete electronics once played. There was also a centrifuge, a FIRARD II therapeutic infrared light for arthritis pain and an Oscilloscope Type 545A for measuring frequencies. “I would use it to make a submarine set for a movie,” joked Joe Trejo, Alcala’s friend who came to help. All About E-Waste Event will be at the Recycle Circus at the Dance Palace on April 19.